Magnetic field topology of the primary component of HD 66051. Distribution of the radial magnetic field component (colour plot) and the field vector orientation (red and blue vectors) are shown at four rotation phases. The field strength is given in gauss. The star is shown at the inclination angle of 86 degrees. Credit: Kochukhov et al., 2018. Astronomers report the discovery of the first known early-type magnetic star in an eclipsing binary system. The finding, detailed in a paper published April 27 on the arXiv pre-print server, could have important implications for our understanding of the evolutionary process of binary stars. Early-type magnetic stars are almost absent in close binary systems, and no such star was found in an eclipsing binary by previous studies. Astronomers propose several theories that could explain this scarcity. For instance, some researchers assume that the presence of a strong global primordial magnetic field inhibits protostellar cloud fragmentation, what disfavors formation of multiple systems. A recent study conducted by a team of astronomers led by Oleg Kochukhov of the Uppsala University in Sweden, could be helpful in determining the most plausible hypothesis regarding the lack of binary systems containing early-type magnetic stars. As part of the research, they observed HD 66051, an eclipsing, spectroscopic double-lined binary, whose photometric variations suggested the presence of an early-type magnetic star. The observations were carried out in December 2016 and January 2017 using the ESPaDOnS spectropolarimeter at the Canada-France-Hawaii Telescope (CFHT) in Hawaii. "Using a new set of high-resolution spectropolarimetric observations, we discovered a weak magnetic field on the primary and found intrinsic, element-dependent variability in its spectral lines," the researchers wrote in the paper. As noted in the study, Kochukov's team found the presence of a global, predominantly dipolar magnetic field on the surface of the primary component of HD 66051. The observations show that HD 66051 A is a magnetic, chemically peculiar star of spectral type B with a non-uniform surface distribution of chemical abundances. The finding makes HD 66051 A the only early-type magnetic star in an eclipsing binary detected so far. Moreover, it is one 10 such stars in close double-lined binary systems. The researchers also found that the secondary component of HD 66051 is a metallic-line star exhibiting neither a strong, global magnetic field nor intrinsic spectral variability. They also calculated the size and mass of both objects in the system. According to the study, HD 66051 A is almost 2.8 times larger and nearly 3.2 times more massive than our sun, while HD 66051 B has a radius of about 1.39 solar radii and a mass of approximately 1.75 solar masses. The astronomers concluded that their findings regarding the HD 66051 system open unique possibilities for detailed stellar interior structure and evolution studies. "For example, one could exploit HD 66051 to test stellar structure models with radiatively driven chemical stratification and put firm limits on the radius modification due to interior non-force-free magnetic fields. One could also probe other poorly understood interior structure processes such as mixing in the radiative zone, convective core overshoot, etc.," the authors concluded. Early-type magnetic stars are rarely found in close binary systems. No such objects were known in eclipsing binaries prior to this study. Here we investigated the eclipsing, spectroscopic double-lined binary HD66051, which exhibits out-of-eclipse photometric variations suggestive of surface brightness inhomogeneities typical of early-type magnetic stars. Using a new set of high-resolution spectropolarimetric observations, we discovered a weak magnetic field on the primary and found intrinsic, element-dependent variability in its spectral lines. The magnetic field structure of the primary is dominated by a nearly axisymmetric dipolar component with a polar field strength Bd≈600 G and an inclination with respect to the rotation axis of βd=13o. A weaker quadrupolar component is also likely to be present. We combined the radial velocity measurements derived from our spectra with archival optical photometry to determine fundamental masses (3.16 and 1.75 M⊙) and radii (2.78 and 1.39 R⊙) with a 1-3% precision. We also obtained a refined estimate of the effective temperatures (13000 and 9000 K) and studied chemical abundances for both components with the help of disentangled spectra. We demonstrate that the primary component of HD66051 is a typical late-B magnetic chemically peculiar star with a non-uniform surface chemical abundance distribution. It is not an HgMn-type star as suggested by recent studies. The secondary is a metallic-line star showing neither a strong, global magnetic field nor intrinsic spectral variability. 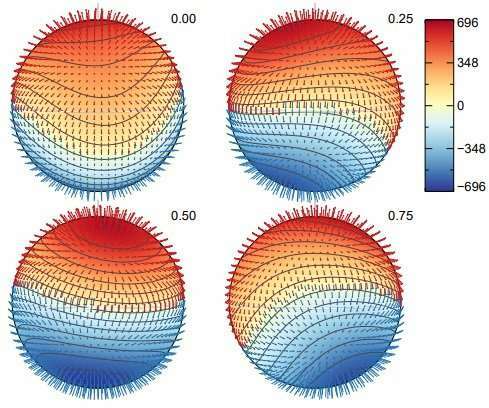 Fundamental parameters provided by our work for this interesting system open unique possibilities for probing interior structure, studying atomic diffusion, and constraining binary star evolution.